My name is Dana Roberts and I am currently working on my third book on Watchman Nee. The first book, Understanding Watchman Nee, praised him as a fine Christian but did not agree with his interpretations of man and the church. Last year I was asked by the publisher to do a new edition. In looking at Chinese sources I found evidence of what had only been hinted at. Nee had misused church money and he had at least two affairs with people in the church. This second book, The Secrets of Watchman Nee, was neutral and told readers that you must read any writer or preacher with caution. Within months of publication I received a call from a woman who was the youth leader and Sunday School Superintendent of Nee's church in Shanghai. She had been present at Nee's trial in 1956. [One of the charges brought against him was licentiousness.] Nee had affairs with two girls she knew in the church. I have also talked to Nee's lawyer. Nee freely admitted it because the police found the pictures. Why didn't the girls leave? Because they believed that all other churches were evil, and they made a pact to confess to God and stay in his true church. Does this sound familiar? I am leaving for Shanghai tomorrow and will gather the last information. One must always remember that Jesus prayed for the unity of the church. There is no true church. All churches that are really churches are justified by faith, rely upon the authority of Scripture and follow some basic instructions that were first formulated in the Apostle's Creed. After that, Christians ought to follow the example of the early synagogue and respectfully discuss it among ourselves without being puffed up with theological vanities. In Shanghai Mr. Roberts spoke with Watchman Nee's personal secretary, with the judge at his trial, and with local church members who had remained in the country after the revolution. He felt confident that these people knew the truth. 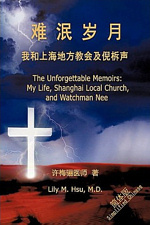 He said that there are a number of Chinese sources written by eyewitnesses, including the most recent, The Unforgettable Memoirs - My Life, Shanghai Local Church, and Watchman Nee, by Lucy M. Hsu, M.D. The back cover of the book says, "At sixteen, Lily made her way to the church on Hardoon Road, Shanghai....In this book, Dr. Hsu, a retired pediatric neurologist, rights a straightforward accout of her eight-year experience in the church. Her faith nearly ended as the private life of Watchman Nee was exposed in 1956..." In Simon Yee's review of this book on Amazon he brings out the author's perception that Nee felt great shame about his ongoing adultery, and because of it he did not often partake in the Lord's supper. Watchman Nee and George Geftakys both taught the carnal vs. spiritual Christian dichotomy, split rapture, and local gathering, learned from the Plymouth Brethren, and T. Austin-Sparks. But it was their doctrines of sinless perfection and the role of intuition, learned from Jesse Penn-Lewis and Madame Guyon, that opened a door for the possibility of immorality by elevating intuition above reason and the plain teaching of scripture. Self-deception was further enabled by Nee's teaching on the possibility of reaching a state of sinless perfection. Kristin's story on this website shows these teachings at work in G. Geftakys. Once intuition is elevated above scripture, restraints are lifted. But in contrast to Watchman Nee's attitude of shame, the doctrine of sinless perfection allows a narcissist with an inflated ego to be convinced he is beyond sin, and that an adulterous relationship is "spiritual". For more on Watchman Nee, see Wikipedia, Apologetics Index, and Watchman Nee and the Little Flock Movement in Maoist China. For more on perfectionism, see On Perfectionism, by Dave Sable, and these two excerpts from B. B. Warfield's book, On Perfectionism - Is God's Grace Suspended until We Act? and The Two Natures. One of the most serious misconceptions among the children of God is that actions are determined by right and wrong. They do what their eyes tell them is right; they do what their background tells them is right; they do what their years of experience tell them is right. For a Christian, every decision should be based on the inner life, and that is something totally different from all else. I yearn that you should come to see that a Christian should arrive at no decision other than that which is dictated by life. If the life within you rises to do a thing, then it is right for you to do it: if the life within shrinks back when you advance, then you should immediately call a halt. Notice that Nee taught that "...If the life within you rises to do a thing, then it is right for you to do it." Need we inquire further for GG's justification for his adulteries? Am I exaggerating? What is Christianity? Christianity is a matter of life. If you are a Christian, then you posses a new life; and when you have to decide on a course of action, you do not ask, Would it be right to do this? You ask, If I do this, how will it affect my inner life? How will that new life within me react to this? Christianity does not require that we investigate the rights and wrongs of alternative courses of action, but that we test the reaction of the divine life to any proposed course. As a Christian you now possess the life of Christ, and it is the reactions of His life that you have to consider. If, when you contemplate any move, there is a rise of life within you to make that move, if there is a positive response from the inner life, if there is “the anointing” within (See I John 2:20,27), then you can confidently pursue the proposed course. The inner life has indicated that. But if, when you contemplate a certain move, the inner life begins to languish, then you may know that the move you contemplated should be avoided, however commendable it may seem to be. Notice especially that Nee said, "Christianity does not require that we investigate the rights and wrongs of alternative courses of action, but that we test the reaction of the divine life to any proposed course." In other words if you feel like doing it, do it. According to Nee, principle of "life" overrules good and evil. I once asked GG about this booklet by Nee. I asked him, "Is this true?" His reply was equivocal..."Let's not make a man an offender for a word." He didn't say yes...and he didn't say no. Now I think I know why. January 2007, Troy Brooks: "The only book Nee ever published of size was The Spiritual Man. Any quotes of Nee's from Living Stream Ministry are illegitimate....hey are often 20 to 30% longer, which right there tells you they are adding. Perhaps your real motivation for bearing false witness may be one of Nee's five central teachings, though each are all fully proven....If you need help in any of these areas and why they are important for spiritual life, let me know. That's what I am here for. Amen. I wrote this in response to your article on Watchman Nee. God will judge that author for his false teachings, sins, bearing false witness. Dana Roberts is not a Christian, by the way." M. Irons: "Thank you for your gracious concern, Mr. Brooks, and your offer of help. At this point in my life, I have made up my mind about the issues you raise, and have come to different conclusions than yourself. I disagree that Nee’s theology has been 'fully proven'. We do indeed take issue with the tripartite description of man, as well as other Nee teachings. This does not mean we don’t believe man has a spirit. We believe it is more accurate to think in terms of the soul and the spirit being intertwined. At conversion the soul is infused with Life by the Holy Spirit, just as Adam became a “living soul” when God breathed into him. Now, many years down the line, I have read and heard ministry that convinces me of a different understanding of Scripture. Our point in taking issue with Nee’s type of teaching is to warn people of the inherent weaknesses in it that pave the way for spiritual abuses. That is the main thrust of our website. For that reason we also warn about the weaknesses in Plymouth Brethren and Higher Life teaching. We have no doubt there are many dear believers who follow Nee and the Brethren and the early Keswick teachers, and find much help in that teaching. Blessings on them. But there are also charlatans, wolves in sheeps’ clothing, who garb themselves in these very spiritual sounding theologies in order to gain unscriptural control over the Lord’s people and they are able to do it because of the weaknesses in these teachings. Folks who are coming out of intense, totalistic, legalistic groups are vulnerable to falling prey to them, and for that reason we sound a warning. It is difficult to do so in a balanced, objective way. When information is brought to our attention. we do the best we can to verify, and then we pass it on to our readers to help them make wise decisions. It is most definitely not our intention to bear false witness, but for our particular readers it is better to be safe than sorry, so to speak. If there is reason for caution in regard to certain kinds of teaching, these folks need to err on the side of excessive caution rather than risk, because of their previous abusive church experience. Should information come to light that removes the suspicion, we most certainly will change our evaluation and publish it. Again, thank you for your concern, Mr. Brooks. I think we must view ourselves on the same side, in the wider view of the spiritual battle of this age. Grace to you from God. In August 2008, Troy sent a link to an additional rebuttal in August 2008, and another in August 2009, along with this comment: "Please correct me if you are not a Calvinist or do not believe in total depravity....All five points of Calvinism are false. The correct teaching is OSAS Arminian [once saved always saved]. You need to be delivered from Calvinism and the mingling of your soul and spirit. Shallow and selfish!" M. Irons replied: "I decline a Calvinist / Arminian debate. There are many, many terms and positions that would have to be defined before we could be sure we understood each other, and I don’t see the point. The fact is that there are quite a few argumentative pugnacious Calvinists, and I do not want to be counted among them. " August 31, 2009, Mark and Connie: The person above [Tom Maddux] didn't site which publisher or edition of the book that he 'quotes' Mr. Nee from. If the quotes are from LSM [Living Stream Ministry] then they are questionable as being authentic, but rather teachings of Witness Lee's nonsense. Nevertheless, having read most of the 'white cover' books by Nee, and those edited by Angus Kinear, I and anyone else will find it impossible to accept as a fact that Mr. Nee taught that one should follow his depraved nature and do those things that are an offence to the Word of God, especially those things warned against in the NT. Read...The Normal Christian Life, Changed into His Likeness, and Against the Tide, all edited by Angus I. Kinnear by CLC and Tyndale publishing. It's just too bad the author is not able to defend himself, so he is an easy target. Sept. 6, 2009, Tom M. replied: "I threw away my Watchman Nee books years ago. So, I got that quote off the internet. At this time, two or three years later I do not recall exactly where I found it. However, if Nee wrote the book at all, which does not seem to be in doubt, I do not see how one could say he did not believe the Life versus Ethics teaching. The entire booklet was on that topic. In addition, it is in complete accord with The Spiritual Man teachings on soul/spirit/mind issues. The idea was that you could not trust your mind's grasp of doctrine or ethics, but had to be delivered from the "carnal mind" and become sensitive to the Spirit. Sorry, but that is the best I can do at this juncture."